Looking to vacation in Fort Washington for less? You can find amazing accommodation deals on Wyndham National Harbor timeshare resales and rentals when you visit SellMyTimeshareNow.com. Enjoy a luxurious vacation with compromising affordability. Experience history, luxury, and the National Harbor—all in one vacation. At Wyndham National Harbor Resort, you'll enjoy prime access to all there is to see in Washington D.C. while enjoying fantastic accommodations and great amenities to enhance your vacation experience. Take advantage of the resort shuttle to visit all the museums, monuments, and shops of D.C., and on-site take advantage of the swimming pools, game room, hot tub, and fitness center. 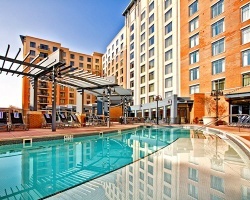 Perfect for families or couples that want to see all the sights of Washington D.C., this resort provides incredible vacation experience for all. 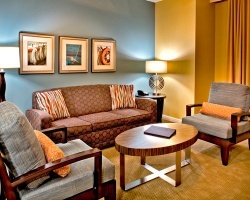 Wyndham National Harbor Resort offers three styles of accommodations to fit any size travel group comfortably. 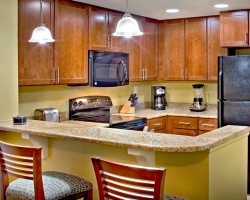 Ranging in size from one to four-bedroom units, there's plenty of room for a large family or even a group reunion. Suites are clean, bright, and modern, offering great amenities such as full kitchens, living and dining areas, whirlpool tubs, and private balconies to enjoy the surrounding views of the National Harbor. You'll love staying in a luxury resort while also relishing in all the comforts of home. Let us help you discover your ideal Wyndham Vacation Resorts at National Harbor resale or rental for your next escape. Fill out the form on the right now, or give us a call at 1-877-815-4227 for further assistance. When you shop the resale market for Wyndham National Harbor timeshares, you'll uncover incredible savings. This is because resorts ultimately overcharge you for a timeshare. You not only pay for the timeshare itself, but additional fees and large sales commissions that drastically drive up the cost. On the secondary market, you'll find that owners advertise their timeshare properties for their accurate market value. This can save you as much as 70% off the developer price! Our inventory of Wyndham Vacation Resorts at National Harbor resales consists of deeded points-based ownerships with annual or biennial usage. You'll see that different timeshare units have different amounts of points attached to them. Upon purchasing, you can use these points to customize your vacations and choose when, where, and how long you travel each time. Owning at Wyndham Vacation Resorts at National Harbor gives you more than just a splendid Maryland getaway every year. As a member of Club Wyndham, you can use your allotted points to customize your annual getaway. You can choose the length of your stay, the time, and even choose which Wyndham resort you would like to vacation at. Wyndham also has very limited resale restrictions set in place, making it possible for all owners to take advantage of a wide variety of membership benefits. Some of the most prominent include discounts on dining, rental cars, and entertainment, access to cruise vacations, and the ability to participate in the Wyndham Adventures program. For even more options, become a member of RCI and you can have access to their entire network of affiliated timeshare resorts. Since Wyndham Vacation Resorts at National Harbor is affiliated with RCI, you can exchange your Club Wyndham points to RCI points and travel to one of their thousands of destinations around the world. RCI is affiliated with top vacation ownership properties in every location imaginable. 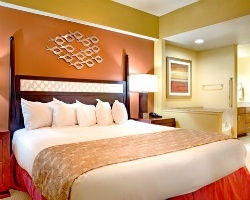 Even more convenient, Wyndham National Harbor is an RCI Gold Crown rated resort. This title gives owners the highest possible trading power within the vast RCI network, making it wonderfully easy to travel wherever your heart desires. Conveniently close to all the history and excitement of Washington D.C., you will have ample options for things to do and explore. Just a short trip away you can visit Mount Vernon, Lincoln Memorial, Library of Congress, Washington Monument, the National Mall, Ford's Theater, Jefferson Memorial, the White House, and so many other exhibits, monuments, and museums. Washington D.C. is bursting with history and culture and with a Wyndham National Harbor timeshare, you can see it all. The resort itself boasts plenty of amenities for fun and relaxation during your stay. On-site, enjoy access to indoor and outdoor pools, a children's pool, hot tub, fitness center, game room, and even a free shuttle into D.C. Already Own at Wyndham National Harbor?